Tile has finally come into the 21st Century. 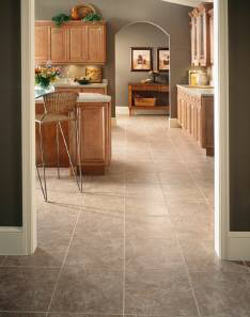 Now you can have all the advantages of a ceramic tile floor with performance features designed to meet today's demanding lifestyles. New DuraCeramic is warmer to the touch, more comfortable underfoot, and faster and easier to install than traditional ceramic tile. You can even choose to install DuraCeramic with grout or without it. The final design is up to you! DuraCeramic is the intelligent choice for todays lifestyle.